Protect the Glen Cove Sacred Burial Site! 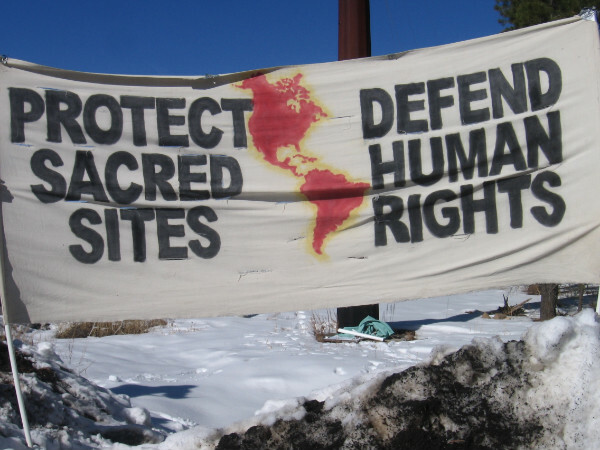 Yet another sacred site is facing destruction in the United States. The Greater Vallejo Recreation District (GVRD) and the City of Vallejo want to convert the Glen Cove Shellmound site in Vallejo, California, into a community park with its own trail, picnic tables, restroom facilities and parking lot. The 15-acre Shellmound site, known to the Ohlone Peoples as Sogorea Te is the final resting place for thousands of Indigenous People dating back at least 3,500 years. Historically, it was a “traditional meeting place where services such as burials were performed for over one hundred local California Indian tribes.” Today it is a memory that must be protected. The “Ohlone [People] say the land’s conversion couldn’t be more insulting, offensive and sacrilegious, particularly because the restrooms would be situated adjacent to the most sacred part of the site, the burial ground,” notes the San Fransisco Chronicle. Bu that’s 15 acres too much, as far as the GVRD and City Council is concerned. Nevertheless, Deocampo says the Tribal Council, who is working alongside Sacred Sites Protection & Rights of Indigenous Tribes (SSP&RIT) and the International Indian Treaty Council, is “Considering a court injunction and are searching for a pro bono lawyer” to stop the conversion plan. For more information or to learn what you can do to help, visit http://protectglencove.org/ or send an email to protectglencove@gmail.com – You can also call Wounded Knee Deocampo at (707) 557-2140. Stop the Illegal Desecration of Glen Cove! Preserve the Past – Protects the Future – Save Our Sacred Sites! The San Pablo Bay Area was once a thriving multi-national region of many indigenous communities. Before the genocide of the Americas initiated by the arrival of Europeans, the area of Solano County was inhabited by the Coastal Miwok and Karkin (Ohlone) nations. Being cultures of traders, they were but a part of a vast network of merchant cultures that extended across the Pacific Ocean and Central America. Many different tribes utilized the benefits of the once-thriving Northern California chaparral, estuary, and wetlands, respecting the diverse yet delicate ecosystems to preserve them for future generations. The Coastal and Bay Miwok, South Pomo, Wappo, Patwin-Wintun, North Yokut, and Ohlone nations had over 500 shellmounds that were located and recorded by the late 18th century, most of them being thousands of years old. The practice of consciously caring for the land allowed these cultures and ecosystems to thrive. For thousands of years, the ecological balance was maintained, and what is now known as California remained a beautiful, pristine environment. As Europeans systematically conquered and enslaved California natives, so too were the villages, shellmounds, and ecosystems exploited and desecrated over the years of colonization. Most of these shellmounds were permanently destroyed along with thousands of years of archeological, anthropological, and spiritual history. In the past 20 years, the few remaining shellmounds and burial sites have been destroyed by shopping mall construction, suburban housing tacks, or other corporate-commercial developments. An infamous local example is the Bay Street Mall located in Emeryville, built over a place of ancestral worship with archeological reports proving that it contained vast burial grounds of the Ohlone nation (hence “Shellmound Drive”). Not only are the physical remnants of these ancient peoples destroyed, but so is the respect and awareness regarding our indigenous ancestors. The 15-acre Glen Cove Shellmound site (registered CA-SOL 236) is one of the oldest known shellmounds in the San Pablo Bay. Known as “Sogorea Te,” this site was first documented in archeological records in 1907 by an archeologist from the University of California and, according to a 1988 report by Novato Archeological Resource Service, is at least 3,500 to 4,000 years old. Many of the sacred items unearthed from the site in previous years remain illegally housed in the Phoebe A. Hearst Museum of Anthropology at UC Berkeley which houses over 13,000 ancestral remains and over 200,000 sacred objects. At the Vallejo site, intact skeletal remains and cremations have been documented along with mortars and pestles, arrowheads, spear points, eagle claws, bear teeth, bird-bone whistles, and many ceremonial feather/shell jewelry ornaments. It is literally the many layers of generations that actually form the shellmound; it is a sacred site, the final resting place for the ancestors of many different California tribes. park with trails, parking lot, and amendments that would effectively degrade and destroy this site. Garlon 4, an herbicide, will also be sprayed, saturating the delicate ecosystem with synthetic chemicals. Preserving and protecting this sacred place in the way those who created it means it is a de facto legal right under the American Indian Religious Freedom Act and is an essential part of Indigenous cultural survival. The desecration of the ancient Glen Cove Shellmound and surrounding burial site and the theft of remains and sacred items is criminal. This ignorance, greed, profit, and power over others, through the abuse of the departed is a crime against humanity. The $1.5 million dollar project is simply an attack by developers who see the land as a direct, intravenous line to their bank accounts. Unfortunately, because of the implications of losing money, many developers choose instead to ignore any artifacts and bones found at a development site. In a bankrupt city, with rising rates of violent crime, schools closing, and homes foreclosed, we can think of better places this money should have been channeled to. Every day, we see the blatant abuse and destruction of our Sacred Sites. Because all humans are indigenous to the Earth, it is up to all of us to protect and preserve the resting places of our Ancestors and other sites that are a rich part of our cultural, spiritual, and traditional heritage. We live in a time where our natural landscapes are fast disappearing, our Sacred Sites are violated, our water and skies poisoned by carcinogenic pollution, our wildlife forced out of their natural habitats while big-box stores, housing developments, and black pavement cover and imprison the land; all in the name of progress.